We met in film school, when our journey of hand crafted storytelling was just beginning. Through the years we've found our quirky selves on many adventures, still trying to find the fun and laughter in it all. We believe in late night oreos (not sponsors, but really we should be), belly laughs with friends that make you lose it so hard the milk comes out of your nose, and working to make dreams a reality. I had the opportunity to take Gideon’s newborn photos last summer. He was the tiniest babe I’d ever taken photos of, and he was so so precious. You can see my blog post on that session here. 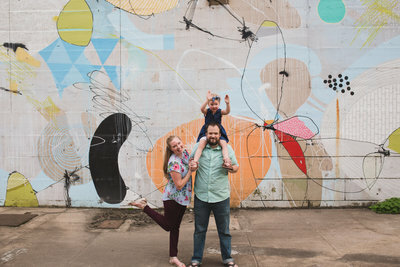 So, when his dad, Chuck, booked a Mother’s Day session as a gift for his wife, Rachel, I was pretty excited to see this sweet family again. The session was at Great Shiplock Park in downtown Richmond, a location that never disappoints. It provides a variety of backdrops, from train trestles and city landscape to scenic river and shady, draping trees. From the moment I turned the camera on, Gideon was all smiles. He’s a charmer! I couldn’t resist taking a few photos with both mom and dad. These are a few of my favorites of this lovely family. Like what you’ve seen? Visit our site here, join our newsletter here, or contact us. We’re always happy to answer questions, chat, and of course, take your photos!